Home Trades What Does This Huge Options Trade Mean For Oil? What Does This Huge Options Trade Mean For Oil? When I write about large options block trades, it’s generally for one of two reasons. First, a lot of smart money is active in the options market. If a very big (i.e. capital intensive) trade occurs with options, it can often be a signal that there’s going to be action in the underlying asset. Second, sometimes I just find an options trade very interesting and worth discussing. It could be because it’s an unusual trade or is an original way to handle risk management. Of course there are times when I write about a large trade because it’s interesting and may provide meaningful insight into the underlying asset. A trade last week I came across meets both of those criteria. More specifically, I noticed a massive covered call trade in United States Oil (NYSE: USO). 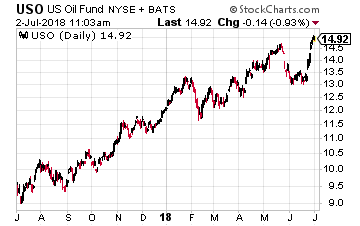 USO is the most active oil ETF. While it has its flaws, trading USO is probably the easiest way for the average trader/investor to trade oil. Beyond trading oil futures themselves, USO is likely the most direct way to trade oil as well. So, is this covered call trade suggesting there’s a limit on how far oil prices are going to rise? Let’s take a closer look at the position. The trade involved a massive 60,000 USO January 2019 calls, which means 6 million shares of USO were purchased against the calls. The call strike sold was the 15, and the stock was right around $15 at the time, in other words, the calls were sold at the money. The 60,000 options were executed in two separate blocks. And, if you average the prices together between the two blocks, you get an average call sale price of $1.35. That works out to $8 million in premium received (or a 9% yield over a roughly 7 month period). With the short calls being sold at the money, the trader clearly does not expect USO (and thus oil prices) to continue climbing through next January. Otherwise, he or she would have sold out-of-the-money options instead to give USO room to climb. (Clearly, as you can see in the chart, oil has already seen sharp gains in recent weeks.) With the at-the-money trade, the max gain on the trade is right at $15 at January expiration. On the other side, the call premium collected means the USO shares are hedged down to $13.65. Plus, the trader may not expect the shares to be offset by the short calls next January. Instead, he or she may be happy to be left long the shares for an effective price of $13.65, and could always continue writing calls against those shares moving forward. If you believe oil’s price increase has run its course, this is a good way to generate income on it, while still giving you a chance in to be long the shares next January. If you think oil has more room to run, you can always sell a higher call strike. The 16 strike trades for about $0.75. That’s not a bad credit to receive, while also giving yourself a bit of upside potential in the stock price.